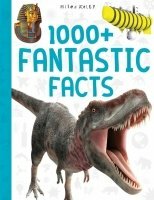 1000+ Fantastic Facts is lavishly illustrated throughout and teaches kids everything they need to know in more than 1000 numbered facts. The numbering system acts as a benchmark, and as children read they can clearly chart their progress. Five subject areas are comprehensively covered: Earth and Space, Prehistoric Life, Animals, History and Science. Cartoons, quizzes, fun facts and projects are scattered throughout to actively encourage reading and learning.